day-for-night shot a cinematographic technique for using shots filmed during the day to appear as moonlit night shots on the screen, by using different lenses, filters, special lighting and underexposure; very common during the 50s and in the 60s, but rarely used in present-day films. deadpan a specific type of comedic device in which the performer assumes an expressionless (deadpan) quality to her/his face demonstrating absolutely no emotion or feeling. Example: a trademark of Buster Keaton's comedic form, seen here in The Navigator (1924). diffusion the reduction or softening of the harshness or intensity of light achieved by using a diffuser or translucent sheet (lace or silk) in front of the light to cut down shadows; diffusion materials include screen, glass, filters, gauze, wire mesh, or smoke; also see soft-focus. (and directing) the creative artist responsible for complete artistic control of all phases of a film's production (such as making day-to-day determinations about sound, lighting, action, casting, even editing), for translating/interpreting a script into a film, for guiding the performances of the actors in a particular role and/or scene, and for supervising the cinematography and film crew. The director is usually the single person most responsible for the finished product, although he/she couldn't make a film without support from many other artists and technicians; often the director is called a helmer (at-the-helm); the assistant director is known as the a.d. ; the director of photography (or cinematographer), responsible for the mechanics of camera placement, movements, and lighting, is known as the d.p. Example: director Ernst Lubitsch on the set - see this site's write-up on the "Greatest Directors"
director's cut a rough cut (the first completely-edited version) of a film without studio interference as the director would like it to be viewed, before the final cut (the last version of the film that is released) is made by the studio. Example: the director's cut version of Ridley Scott's futuristic adventure, Blade Runner (1982). Dogme 95 a collective of film directors founded in Denmark in 1995 led by Lars von Trier, with a distinctive democratizing philosophy and set of rules (termed "the vow of chastity") that rejected special effects and contrived lighting/staging and camera work, and espoused returning to more "truthful" and honest, "non-Hollywood" forms of cinema; the ten rules included shooting on location, use of hand-held cameras, natural lighting only, no props, use of digital-video (DV), lack of credits for the director, etc. 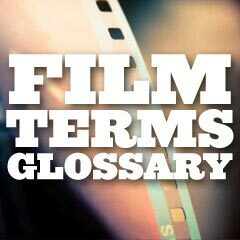 Examples: Thomas Vinterberg's Festen (The Celebration) (1998), von Trier's Idioterne (The Idiots) (1998), writer/director Harmony Korine's Julien Donkey-Boy (1999), Søren Kragh-Jacobsen's Mifune (1999), Jean-Marc Barr's Lovers (1999, Fr. ), Richard Martini's Camera (2000), Kristian Levring's The King is Alive (2000), Lone Scherfig's Italian for Beginners (2001, Denmark). Dolby stereo a stereo-sound process for motion pictures created by Dolby Laboratories, Inc., used to improve sound quality; 35mm prints have two optical sound tracks (Dolby can decode and playback on four channels), while 70mm prints have six magnetic tracks for multi-channel playback; by the 1990s, Dolby Stereo was superceded by advanced digitally-recorded sound Examples: The first Dolby encoded stereo-optical soundtrack on a feature film was Ken Russell's Lisztomania (1975). Other Dolby stereo soundtracks existed for Star Wars (1977), Apocalypse Now (1979), Close Encounters of the Third Kind (1977), and Superman (1978). refers to a moving shot in which the perspective of the subject and background is changed; the shot is taken from a camera that is mounted on a simple tripod, or on a hydraulically-powered wheeled camera platform (sometimes referred to as a truck or dolly), pushed on rails (special tracks or dolly tracks) and moved smoothly and noiselessly during filming while the camera is running; the dolly carries the camera equipment and often some of the camera crew - and occasionally the director; a pull-back shot (or dolly out) is the moving back ('tracking back') of the camera from a scene to reveal a character or object that was previously out of the frame, dolly in is when the camera moves closer ('tracking in') towards the subject, and dollying along with (or 'tracking within') refers to the camera moving beside the subject; also known as tracking shot, trucking shot, follow shot, or traveling shot; contrast with zoom shots. drive-in an outdoor movie theatre in which the patrons viewed a film from their automobile; films projected were often B-films or low-budget films; reached their peak in terms of popularity and numbers in the 1970s; also called a passion pit, ozoner; contrast with a hard top (or indoor movie theatre). (or dubbing) the act of putting a new soundtrack on a film or adding a soundtrack (of dialogue, sound effects, or music) after production, to match the action and/or lip movements of already-filmed shots; commonly used when films are shot on location in noisy environments; also refers to adding translated dialogue to a foreign-language film; as opposed to direct sound - which is sound recorded when filming a scene; contrast to looping. (or canted angle) a shot made with the camera leaned to one side and filming at a diagonal angle (the horizon is not parallel with the bottom of the frame); see also camera angle. Examples: in Carol Reeds The Third Man (1949).